From October 2014 production, there is a specification change to lightweight moulded model RDH-3P1. The power LED in the RDH-3P1 will change as the manufacturer has discontinued the part used. The current model power-on LED glass is green and bright green powered. The replacement LED will be colourless/clear when unpowered and bright green when powered. The RDH-3P1 is an enclosed version of the Rosahl membrane dehumidifier and a matched power supply in a simple lightweight moulded plastic enclosure and comes complete with a power lead. This model is not CE marked, but it is RoHS compliant. The RDH3-P1 has a dehumidifying capacity of 2.9 grams of water per day, making it suitable for sealed enclosures up to 350 litres. The weight is 250 grams and the operating temperature range is -10 to +50 C. The unit has an annual average power consumption of 3 Watts. The RDH-3P-100V version is supplied with a standard 110V plug generally suitable for US socket connection whilst the RDH-3P-200V cable is fitted with crimped terminals for the user to make appropriate connections. 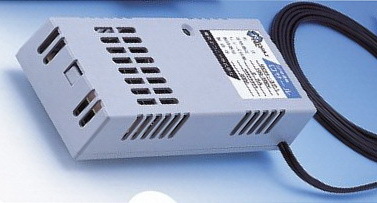 Both 100V and 200V versions are suitable for a supply voltage of 84 to 264V AC. Neither model is supplied with a humidity controller type C-M1J which must be purchased separately. Rosahl micro dehumidifiers are generally available simply as membranes for integration within a customer’s own equipment to allow for a variety of configurations. Where a complete assembly is preferred, they can also be supplied with a range of metal or plastic enclosures, and with or without a humidity controller. It should be noted that the assemblies are not suitable for use within the European Union as they are not CE marked in accordance with the European EMC or Low Voltage Directives. Separate CE/UL marked power supplies are available on request. Rosahl dehumidifiers have no moving parts so there is no noise or vibration when operating.